Tunisian poster for the film, An-nasir Salah ad-Din (Egypte, 1963) directed by Youssef Chahine. Wikicommons/ Netherlands museum for world culture. Some rights reserved.This is another interview in a series on the dilemmas and contradictions researchers encounter in undertaking research in the Middle East. The idea of interviewing social scientists on the processes of the production of knowledge has been inspired from Michael Burawoy’s concept of ‘public sociology’, which he initiated and was followed by other sociologists who carried out further interviews with social scientists in ‘Global Dialogue’. Mona Abaza (MA): As an architectural and urban historian of Middle Eastern cities, specifically Cairo, you have devoted much of your scholarship to the question of the Arab and the Middle Eastern city? Why is this concept important to study? Nezar AlSayyad (NA): The answer to the question of “What is the Middle Eastern city?” raises the question, “What is Middle East?” During the two decades when I was chair of the Center for Middle Eastern Studies at Berkeley, I used always to ask my students, “Middle of what? and east of where?” We know the answer to that question: it was born out of a very specific colonial legacy. 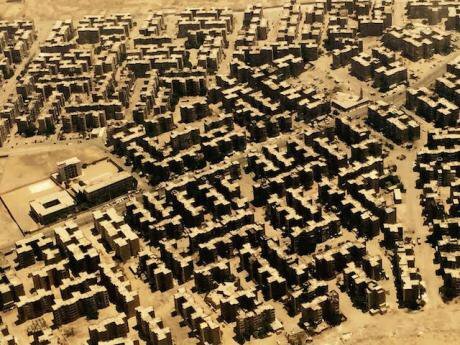 AlSayyad analyzes settlement forms both historic and contemporary. However, it is really important to recognize that the origin of a concept is often far-removed from its current use. The “Middle East” as a concept has been sustained mainly because the people for whom it was intended ended up adopting it as a self-description. No group in the Middle East ever talked about themselves as specifically Middle Eastern in the nineteenth century. But over time, after the rise of independent nation states, two groups of people in the different emerging nations of the Middle East adopted this terminology. These were politicians who engaged with the rhetoric of nationhood and nation-building, and academic scholars who were trying to put themselves on the political scene. Both adopted this terminology with a degree of flexibility, sometimes using the term “Arab,” sometimes “Middle Eastern,” and sometimes “Islamic ” for their own purposes. Although the category itself is not a very accurate historical or geographic category, it remains a convenient geopolitical category for both the formerly colonized people as well as their former colonizers. (MA): How do historians of architecture explain the production of the built environment and the contributions they make to this? How should those interested in the politics of space understand the significance of the social production of the built environment in the current era? (NA): The built environment is a good reflection of society and culture, its practices and social norms, and even its structure. A very important aspect of the built environment is that it is not static, it responds to immediate changes in family composition, societal structure, and the economy. No city ever stays the same even in a single decade. But all cities have their own frames of reference, significant historical traces which tell their story. For me, the built environment provides solid evidence of these types of changes. Ibn Khaldoun, the great Arab philosopher and jurist wrote 500 years ago that the history of nations and states is the history of their cities. Similarly, the history of the modern Middle East is certainly a history forged by its cities. Urbanism cannot and should not be seen as a separate arena, which only architects and planners engage with: it must be a fundamental domain for historians and geographers as well. 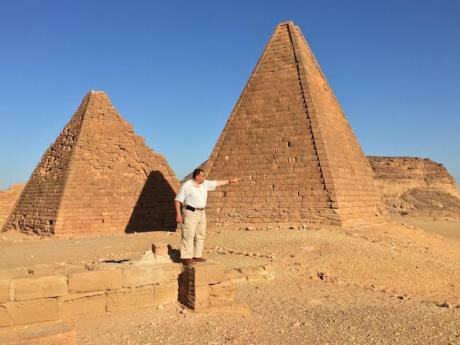 AlSayyad at the pyramids of Meroe. Urbanism cannot and should not be seen as a separate arena, which only architects and planners engage with: it must be a fundamental domain for historians and geographers as well. (MA): For example, could a comparative history of urban development explain the success and failure of the different uprisings in Arab cities? (NA): The answer to this question depends greatly on the choice of cities we include in this category. I have frequently been interviewed by journalists who want immediate buzz words as answers or predictions. I am a historian, so I am not in the business of prediction. Of course asking about the future requires a reflection on the past. But history cannot really fully explain for example why an uprising in a particular Arab city was successful while it was not in another. To give you an example, the tremendous accessibility of Tahrir Square from areas that are very different in the city played a significant role in the apparent but short-lived success of the Egyptian uprising in January 2011. Around Tahrir Square, there was the middle class district of Manial to the south, the dense and populated Giza to the west, the upper middle class neighborhood of Mohandiseen to the northeast, the working class district of Shoubra to the north, and downtown Cairo to the east. What you have are five or six areas that represented all of the cultural and socio-economic classes from all of Egypt. Add to this the historical significance of the square overtime for Cairenes and the fact that it was also the venue for earlier protests against colonialism and staging other important political events. In this regard, history serves as an interrogative method not as a predictive tool, and urban space becomes a solid form of evidence for it. This way, history allows us to theorize about time but also about space and the interaction between space and time. This is particularly evident in the study of cities and their urbanism. (MA): Your scholarship has engaged extensively with “cinematic urbanism” particularly the co-constitution of the reel and the real. Can you introduce us to this in the context of the Arab or Middle Eastern city? (NA): Although most of my scholarship has engaged with either the Middle East or Third World, that book, Cinematic Urbanism, was the exception: it only dealt with the western city. The presentation or configuration of those cities as they have appeared in film, and possibly as they have been invented in film, often becomes the mechanism through which we experience those cities. For me there is no New York without Woody Allen’s New York or Martin Scorsese’s New York. The two become two sides of the same coin as they sustain each other. The real sustains the reel and the reel sustains the real. 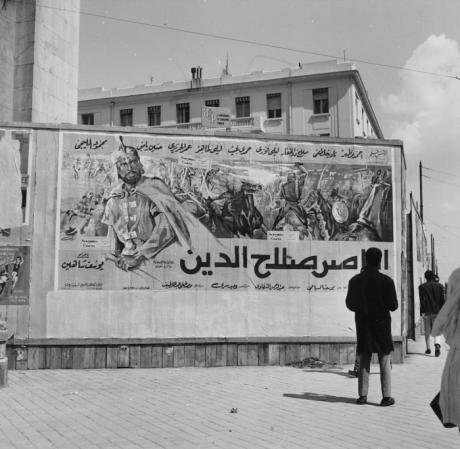 I am interested in the Arab cinematic city, and am currently writing a chapter entitled “Cinematic Cairo” for a book about cinema and the city around the world. I am interested in Mahfouz’s old Cairo, Aswani’s neoliberal Cairo, or Shahine’s cosmopolitan Alexandria as they have appeared on film, and to what extent our understanding of those cities today is often based more on the virtual medium than it is on the physical experience. Similarly, I think social media will also have an effect on urbanism, because our experience is becoming more informationally-based and less place-rooted. One may ask to what extent Facebook is going to be part of the life of Cairenes? We do not know yet. We have to wait and see. AlSayyad at the source of the Nile in Burundi. One may ask to what extent Facebook is going to be part of the life of Cairenes? We do not know yet. (MA): I would like to know more about virtual versus physical experience. Tell me about your encounters as an architect with the physical experience of the city. How does that influence your work? (NA): Since the introduction of cinema and television, the connection between the real and virtual has become increasingly complex, particularly nowadays because of the new communication technology, the internet and social media. Let me share a personal anecdote with you. 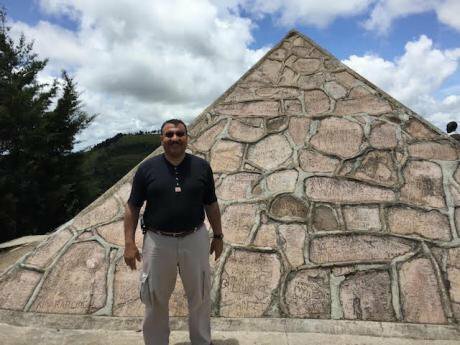 At a field trip that was part of a conference I organized in Cairo more than a decade ago, I encountered an American academic on the Giza plateau at the foot of the Pyramids. He was looking down toward the Sphinx in its pit. “Oh, but it is so small,” he was saying. Clearly he was really disappointed. His comment puzzled me, but it took me a couple of minutes to make sense of what he meant. When I went to look at his conference badge, I figured out what was going on in his mind. It turned out that the man was a teacher at the University of Nevada, Las Vegas. His city houses the famous Luxor Hotel and Gambling Casino, built as a glass pyramid with a greatly enlarged sphinx serving as its entrance. The professor often parked his car in a lot that faced the giant Las Vegas Sphinx. When he was in Giza and saw the real sphinx, he was disappointed, not only because the real thing did not live up to its simulacra, but also because along the way reality had ceased to be relevant when the image or replica became the principal frame of reference. Simulation here is no longer a referential frame but a new way of being that challenges our perception of reality. (MA): Coming back to the present, what are some of the challenges you have faced in Egypt or in other cities of the Middle East while you were undertaking field research ? (NA) Working in the Middle East in general and in Egypt in particularly has become increasingly difficult. There has always been a suspicion regarding researchers in Egypt. Even the simple act of taking photographs of spaces or buildings, let alone political activity, immediately elicits attention and questioning not only from the security apparatus but also from ordinary individuals. What complicates matters, of course, is the absence of an archiving methodology or an investigative research culture in Egypt. As an urban historian, the tools of my trade include the study of buildings and spaces and the documentation of activities that have occurred in them, often only available in archived documents. Being denied access to the written documents or being prevented from documenting physical spaces under the guise of it being a threat to security is very frustrating. But more seriously the real problem is a lack of appreciation of history by the general public and their willingness or openness to accept myth as history. I remember when I was doing research for my first book “The streets of Islamic Cairo” more than three and half decades ago, I encountered many an old man who had lived in the area for all his life. While I was documenting the Mamluk structures along the main spine of the medieval city, he insisted on walking with me to explain to me as a resident what he knows about these building and to my shock much of what he knew was at best inaccurate and at worst stories that fall more into the realm of myth than historical reality. But I also remember that after spending half a day with me, his advice to me as an architect was that I should forgo the project of documenting these old structures and focus on the future. His words still ring in my ears, “Why look at these old things and ruins, there is nothing for your generation here”. As I matured as a scholar, I realized that he represented a significant segment of the Egyptian people in terms of how they view their history. I encountered another equally large segment who were very proud of that history, although upon further questioning I came to the conclusion that they too are proud of something that they do not know and have not taken the time to understand. I think that both of these attitudes contribute to the state of intellectual malaise that exists in Egypt today. (MA): How are you perceived as an Egyptian-American in Middle Eastern cities, and has it become easier to do research? (NA) It will never be easy to do research in the Arab World whether one is a local or a foreigner. Knowing the language well and being able to blend in with ordinary people and not stand out are important attributes regardless of your nationality. Of course if you are white, blonde and blue-eyed, you will encounter more resistance and possibly lack of cooperation because the current regime has spread the idea that anyone who looks like that and is interested in issues of daily life in Egypt must be a spy or must have sinister motives. Look at what happened to Giulio Regeni – someone who spoke such perfect Arabic he could be mistaken for an Egyptian and who loved the country. Yet, once his foreign nationality and the subject of research were known, his life was in immediate danger. As someone who grew up in Egypt but became a US citizen I am lucky that I blend in easily, a matter that gives me access to many areas in the city that I would otherwise not be able to enter. I also believe that one’s ethnic and cultural identity is inseparable from one’s scholarly identity. One of my favorite writers who made me aware of this fact is the British sociologist Stuart Hall. Hall was a black man from a Caribbean island that was part of the British Empire. He landed in Great Britain at a young age and although he was a British citizen he encountered the usual racism that people of his skin color suffer. But as he delved more into English society, he started to question what is means for one to be English. He concludes that he is more English than the English himself by reminding us that he is the leaf and the sugar at the bottom of that cup of tea. In one of his more famous statement he asks, “ What does anyone know about the English, other than the fact that an Englishman cannot go through the day without his sugar-sweetened cup of tea?” He then remarks that in England there is not a single tea or sugar cane plantation. Where does the tea and the sugar come from? From India, the Caribbean, and other former possessions of Great Britain! And then he concludes that he is more English than the English himself by reminding us that he is the leaf and the sugar at the bottom of that cup of tea. For me this has always been an inspiring quote because it reminds us that as scholars we should never forget who we are and where we come from, but that we should always embrace the identities that we develop into because of our acquired knowledge. The Nile in Mansura. 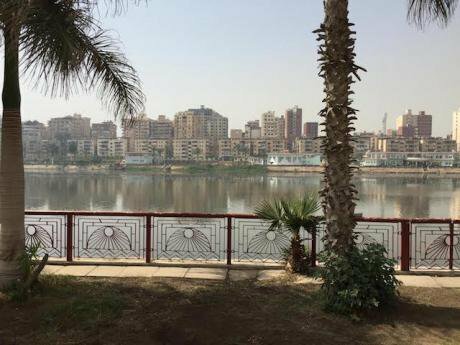 AlSayyad's latest book is entitled, 'Nile - urban histories on the banks of a river.' Author's own pics.